HAITI: At least 473 people are now known to have died as Hurricane Matthew levelled swaths of southern Haiti last week, officials said yesterday (Oct 11), as hard-hit communities struggled to rebuild homes and access food and clean water. 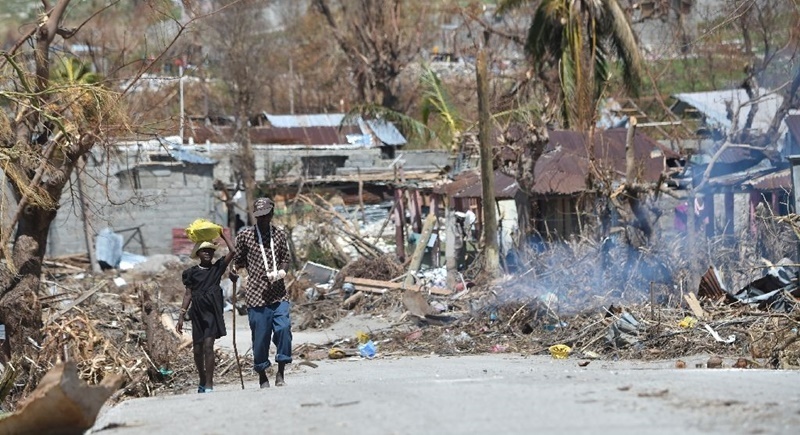 Haiti is observing three days of mourning for victims of the deadly storm, which also left 75 missing and 330 injured according to the provisional toll from the nation’s civil protection agency. More than 175,500 people remain in shelters across the country, many of them in schools – which is keeping nearly 100,000 children from resuming classes. Interim President Jocelerme Privert said those affected would receive humanitarian aid but warned against extending emergency help without a plan for long-term reconstruction. “If we continue to bring emergency food aid to victims – without taking steps to recapitalise them, for money to circulate in affected areas – the risk of exodus to large cities is still there,” Privert told journalists. Privert said the Haitian government has sent 40 containers of food aid to affected regions, which he said cost the treasury more than $400,000 (B1.7 million). Matthew struck as the impoverished nation was struggling to stifle a cholera outbreak that authorities fear will now worsen, with the World Health Organisation yesterday pledging to send a million doses of cholera vaccines. Two water purification stations also arrived in Port-au-Prince yesterday as part of France’s first shipment of humanitarian aid, which comprised some 69 tons of supplies including medicine and anti-cholera kits. Each station produces 250,000 litres of drinking water per day. But damage to roads and communications has hamstrung deliveries of supplies in some areas, according to an AFP journalist in the southern coastal village of Groteaux. Many residents of that community were still struggling to find food and clean water as they scrambled to repair their battered homes. Many Groteaux homes sported new tin roofs bought at inflated prices, but poorer families could not afford new metal sheets to shelter them from intense sun, tropical rains or bloodthirsty mosquitoes. “Only God knows what we will eat,” Jean Nelson, 68, said. “We are eating only coconuts that fell. “We don’t have money for rice,” he said, adding that the price of the staple has doubled in the past week. Nelson said that even though roads are now accessible, with cell phone coverage also starting to improve, no Haitian officials or relief workers have visited the hard-hit town. The UN envoy Sandra Honore yesterday urged the Security Council to keep UN peacekeeping forces in Haiti for another six months to help cope with storm damage, ahead of a vote on renewing the mission’s mandate. The world body’s chief Ban Ki-moon said a massive international response was needed to help Haiti as the United Nations launched a $120mn (B4.2bn) flash appeal for the next three months. Privert said Haiti would head efforts to tackle the latest humanitarian crisis to hit the island, where much of the population is sceptical of aid promises from abroad as well as the government’s ability to manage distribution. “There are not two players on the field but one: the state,” Privert said, adding that Haiti alone does not have the resources to meet the needs of the population. The WHO said Tuesday it would send a million cholera vaccine doses to Haiti after the nation – the poorest in the Americas – began seeing cases surge after Matthew’s pummelling. WHO cholera expert Dominique Legros told reporters in Geneva there had already been “a sharp increase” in cases in the south of the country, with 148 cases detected in the Grande Anse department and 53 more in the Sud department. Grande Anse in Haiti’s southwest took a direct hit from the storm, suffering by far the highest toll with 244 dead, the civil protection agency said. The WHO has called for the strengthening of Haitian health facilities so they can handle the brunt of the humanitarian crisis, rather than relying on outside medical intervention. “The best people to help Haitians are Haitians themselves,” Jean-Luc Poncelet, the country representative for the UN’s WHO, told reporters yesterday. “Priority must be given to the institutions already working in the country.